Vector graphics are hands down one of the FASTEST and EASIEST ways to jump start your next PowerPoint presentation. 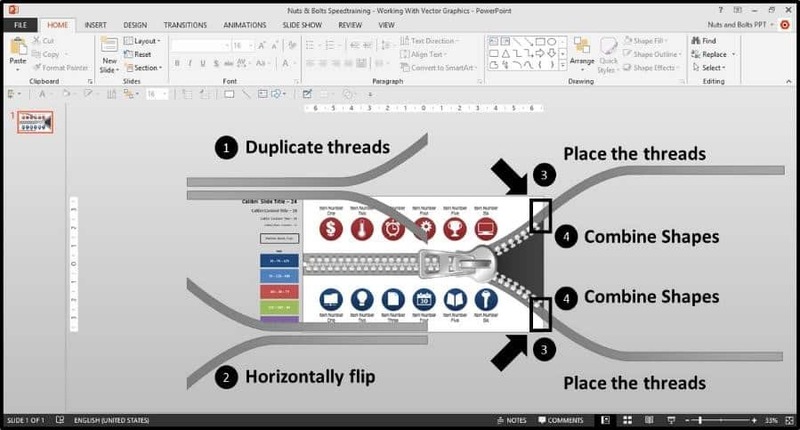 For PowerPoint beginners, they are great pre-built graphics that you can quickly customize and re-arrange to make your slide (and more importantly, you) look good. For PowerPoint pros (like we aim to make you here on our blog), vector graphics provide an incredibly malleable raw material from which you can build just about anything you like. In the tutorials below, I’ve included both basic and advanced techniques to help you get more bang for your buck when using vector graphics in PowerPoint. 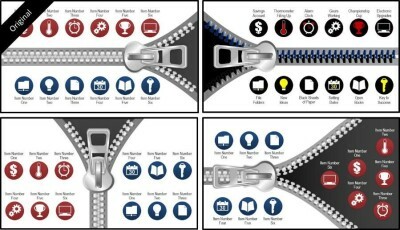 A big thanks to Mike and Jennifer from GetMyGraphic.com for donating this zipper graphic to us for these tutorials! Let’s talk about what vector graphics actually are and why should you use them. 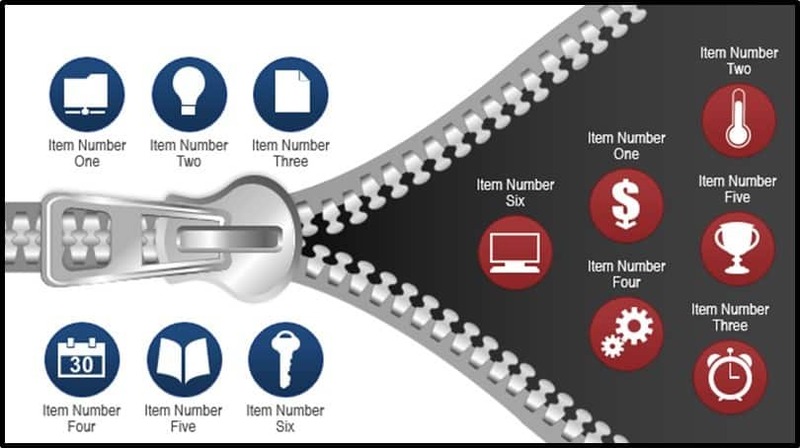 It’s basically just a picture made up entirely of PowerPoint shapes that you can use in a variety of ways (like this zipper graphic, used in 4 different ways). Inspiration: You can take your slide idea or content to a list of pre-built vector graphics to figure out what works best for your message. Speed: Find your inspiration and get a jump start on your layout…you don’t have to waste time trying to build the graphic out yourself. Edit-ability: You have full 100% customization control over a vector graphic. You can recolor it, type into the shapes, resize the graphic (without losing quality) or break it apart and rearrange the pieces however you see fit. And it’s the edit-ability of vector graphics that when put in the hands of a PowerPoint power user (which is what we strive to turn you into) that is like throwing gasoline on the productivity bonfire. And then decide that you want the zipper to be halfway across the slide (instead of on the far right), you can simply break it apart and extend it (see tutorials below). Now, while these graphics are potentially build-able from scratch in PowerPoint, I can’t even BEGIN to imagine how long it would take to create them (and have them look this good)! So unless you’d want to try building this zipper as your own personal challenge, why on earth waste your time? You’ll never “out build” something in PowerPoint that’s already been built! Note: Vector graphics are also great for building custom animations. To see how to use them in that context check out this article on how to create animated scenes in PowerPoint using vector graphics. Below I’ve included some basic and some advanced techniques for working with vector graphics that you can use to get more bang for your buck in PowerPoint with any vectors you buy. If you're using PowerPoint 2016 (Office 365 version), you can no longer use the popular EPS vector file format (due to security concerns. 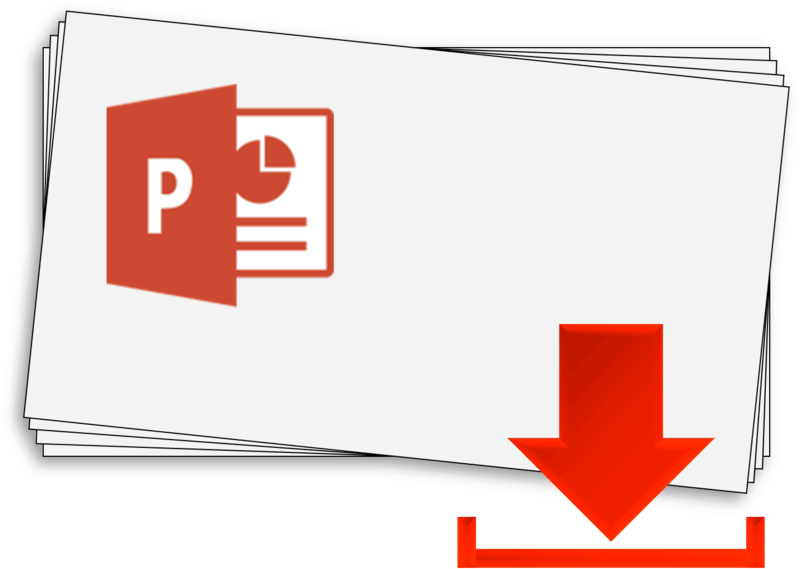 To see how to work around this issue, check out our article on how to import EPS files into PowerPoint. The most basic way you can get more bang for your buck out of your vector graphics, is formatting, editing and rearranging the pieces within them (which is often overlooked). You can think of the graphic itself as a blank coloring book that you can fill in with your corporate colors and/or resize and reposition it to fit your message. Starting with your vector graphic selected, begin un-grouping the graphic (CTRL + SHIFT + G for PC users) and your graphic will begin breaking down into its individual shapes (depending on the complexity of the vector graphic, you may have to do this a number of times). 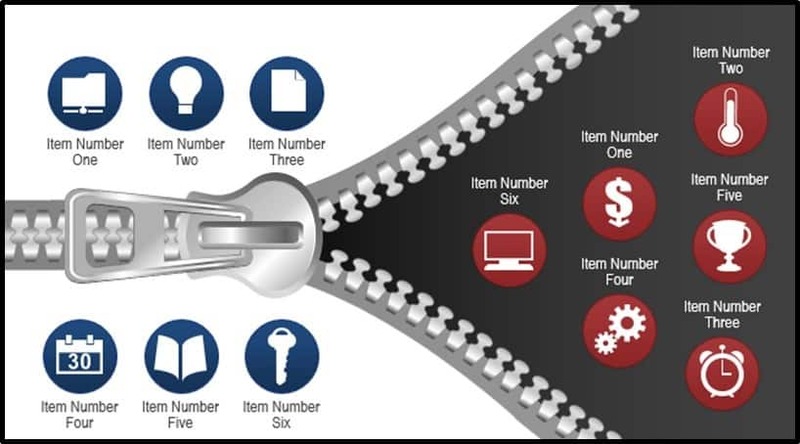 After un-grouping this zipper graphic twice, you can see that it is made up of dozens of different PowerPoint objects. Note: Did you know you can also break tables apart in the same way? Check out our popular article about the Four Things You Didn’t Know You Could Do In PowerPoint, to see how. To learn more about grouping and ungrouping, check out our ultimate guide on how to use the group command in PowerPoint. With your vector graphic un-grouped or broken down, you can then freely format and edit ANY of the individual shapes, just as you would with any other set of PowerPoint objects. Notice below that I’ve formatted some pieces of the icons and applied a custom gradient fill to the zipper teeth. From a formatting perspective, the sky is the limit with vector graphics in PowerPoint…so let your creativity run wild. Keeping in mind that everything in your graphic is simply a set of grouped shapes, you can customize your vector graphic by moving and/or rotating these shapes. 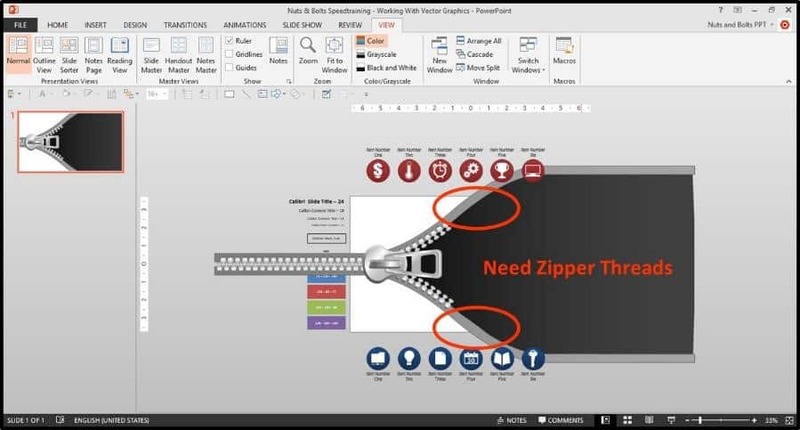 For example, in the zipper graphic, I can rotate the zipper itself, by holding the ALT key on my keyboard and hitting the left arrow key, creating the impression that the zipper is zipping the slide open instead of zipping the slide closed. In the same way, you can rotate your entire vector graphic in PowerPoint to better suit your needs. 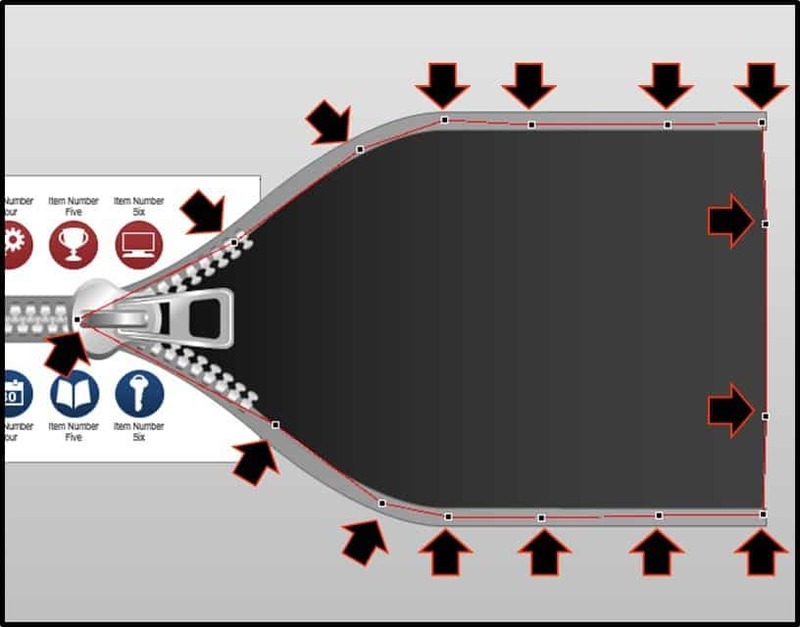 For example, you could rotate the zipper graphic to the left-side of the slide or zip the slide open vertically, down the center of the slide. With a few clever PowerPoint tricks, you can get more bang for your buck out of your vector graphics by extending them in new and interesting ways. 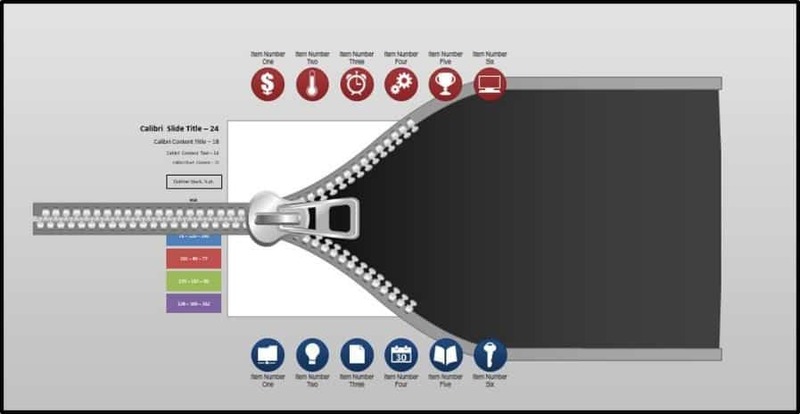 For example, below I’ve taken the zipper graphic halfway across the slide, zipping open the slide and revealing the different icons (see how to do this in the tutorial below). Beyond the basics above, vectors graphics are a great starting point for building even more complex visuals and advanced layouts. You can mix and match the different pieces of multiple vector graphics together to create your own unique layout, or even extend a vector graphic across your slide (as demonstrated below). Doing so will give you a new arsenal of ideas that you can take to your graphics to get more bang for you buck in the future. 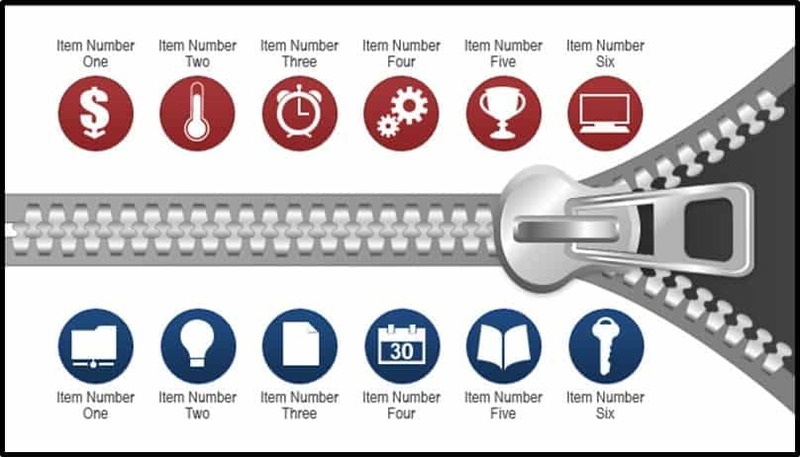 Since you don’t have the actual zipper graphic to work with, below are the highlights for how you can take a vector graphic, and customize it to meet your needs. Hopefully the tips below gives you some inspiration for what you can do with your own vector graphics in PowerPoint. Use the Combine option within the Merge Shapes tool in PowerPoint 2013 to make the pieces a single shape (PowerPoint 2007 users will have to settle for grouping). Note: PowerPoint 2010 users need to use the Combine Shapes tool which is not in the ribbon. You need to add it using the More Commands option at the end of your QAT. You can download our QAT (all set up) by clicking here with instructions of how to set it up. Next you want to extend the background triangle and use Edit Points mode (right-click the shape and select Edit Points) to cover the extended zipper area. In Edit Points mode, you can right-click the the edges of the shape and add new points to the shape. With the new points added, you can then stretch them out to warp the shape to cover the entire area. With the background triangle extended, you can then drag the entire graphic into position to fit your slide. Now we just need to add additional zipper teeth. The trick to adding the zipper teeth to the graphic is using the Duplicate command, CTRL + D on your keyboard for PC users. First duplicate the second to the last zipper tooth, place the new tooth on top of the last one, and then hit CTRL + D to duplicate again, and the new zipper teeth will automatically jump into position. Repeat for the bottom zipper teeth and you’ll end up with a graphic like this. Although the previous vector graphic works fine for printing or presenting your slide, if you want to show your slide to someone it might look a bit messy. You can clean up the edges using the Subtract option within the Merge Shapes tool if you have PowerPoint 2013 or 2010 (a.k.a. the Combine Shapes tool). To do this, simply place a rectangle (or any other PowerPoint shape) over the areas that you want to remove. First select the object that you want to keep (the zipper thread), then select the rectangle that you are cutting away. With both objects selected, navigate to the Drawing Tools Format Tab, select Merge Shapes in PowerPoint 2013 and then select Subtract, and the piece of the graphic is removed. ​Continue adding rectangles and subtracting the different pieces around your vector graphic. You need one rectangle (or any other PowerPoint shape) for each piece that you want to subtract from the graphic. After you’re done, the extended graphic perfectly fits your slide! With the edges of your graphic trimmed, you can then place your icons and you are ready to go! 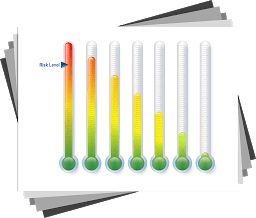 Get these cool temperature gauge vector graphics, to use and customize in your own presentations! 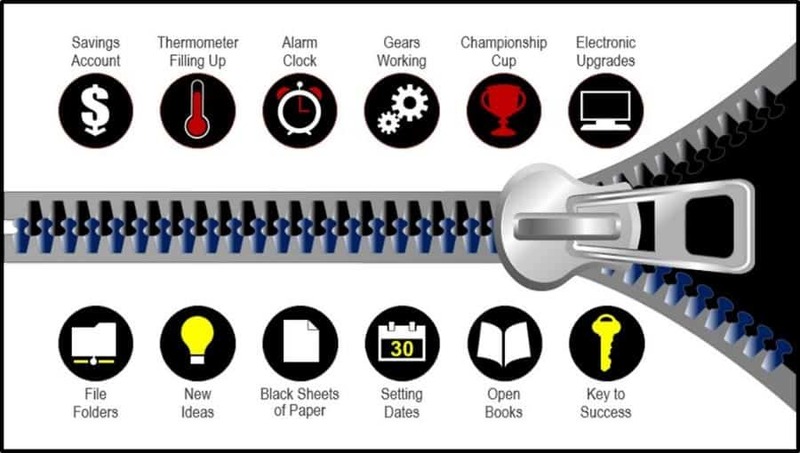 Sign up to our email newsletter to get immediate access to these cool temperature gauge graphics, and you'll also get the latest & greatest hacks for PowerPoint, sent to your inbox once or twice a week.